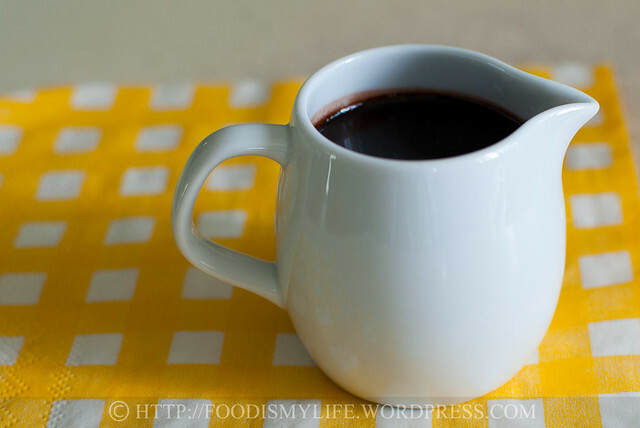 This is the easiest, fastest and very delicious chocolate sauce that I whipped up – in less than 3 minutes. Yes, you heard me right – 3 minutes! And you only need 4 ingredients which are definitely found in your pantry! 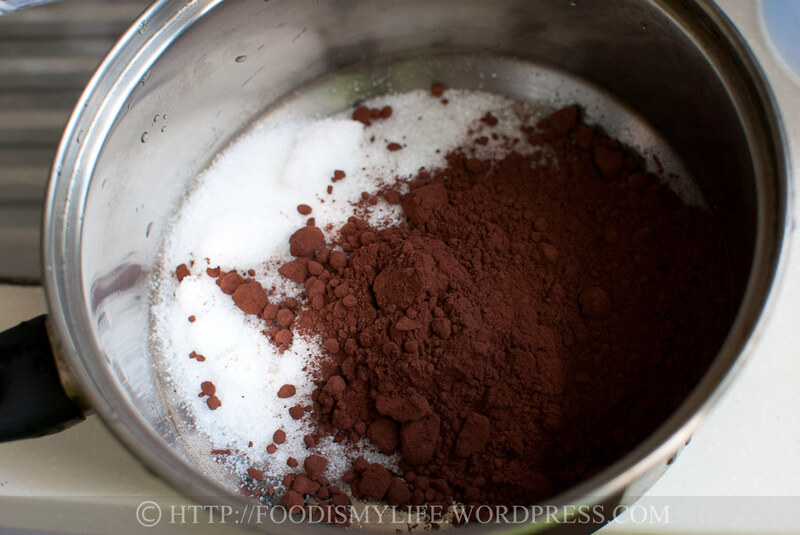 1st minute – measure sugar and cocoa powder. 2nd minute – add in water and bring the mixture to a boil. 3rd minute – measure some butter and whisk it in. And that’s it! Now you just have to let it cool. 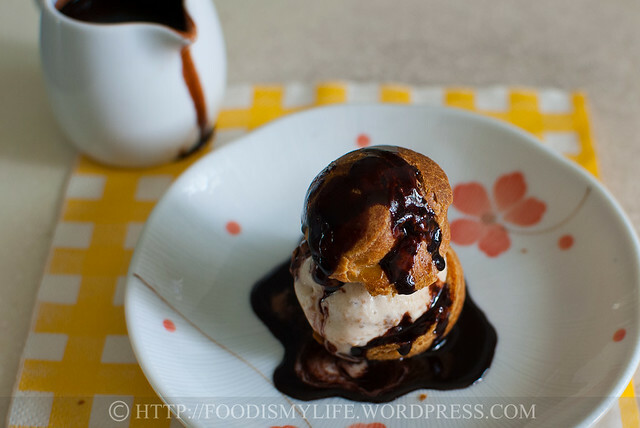 Here’s what I did to my chocolate sauce: I grabbed a puff (recipe here) and fill it with ice cream. And then I pour the warm chocolate sauce on top – oooh la la! Pure bliss on a plate! Combine the cocoa powder, caster sugar and water in a small pot. Bring it to a boil over medium-high heat, whisking constantly to dissolve the sugar and cocoa powder. Remove the pot from heat and stir in the butter. Let the sauce cool before transferring it to a serving container. The sauce will thicken slightly when cooled. Make ahead: Keep the sauce covered in the refrigerator for up to 1 week. Warm it up in the microwave or in a pot and whisk till smooth before using. Use the best quality cocoa powder you can find. 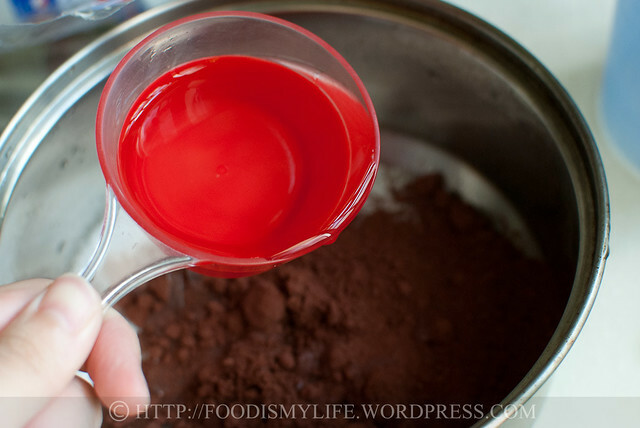 I love Varlhona cocoa – it’s expensive, but worth every penny! The resulting sauce is bitter-sweet, so if you like a sweeter sauce, add in more sugar while it’s still warm. A fellow foodie, Jane, tried out this recipe and used water instead of milk, and she said the resulting sauce is even better! I guess the milk make the sauce richer and thicker! Thanks Jane! Thank you Suhbashini! Glad you like the sauce! Hi Neva, I’m so happy you like the recipe 🙂 Added cup conversion on the water, thanks for the suggestion! Thanks Rida! I love this sauce with ice cream too! Loved it! So easy and so tasty! Perfect! Thank you! 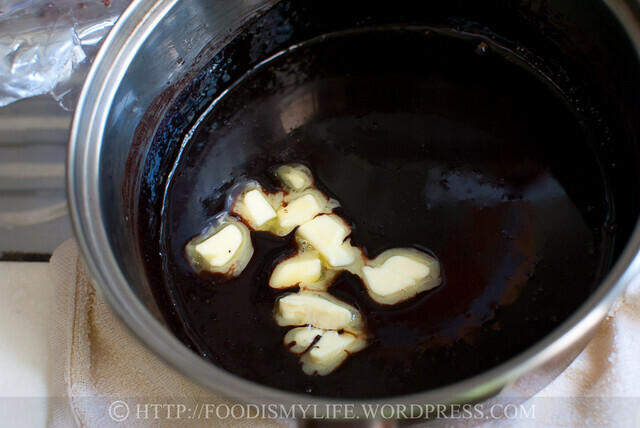 It’s my favourite chocolate sauce recipe! Thanks for sharing this! It’s so yum! Added it on my list! Can it b used to cover cake? Hi, I will not recommend this to cover the cake as it may not be thick enough. Use a chocolate ganache (chocolate to cream in the ratio of 1:1) if you want to cover the cake. I’m glad you like the recipe! Off to check your pancakes out! Try it with milk instead of water. Even better! Glad you like it Joyce! This does look so rich and delicious and it’s too easy to make. 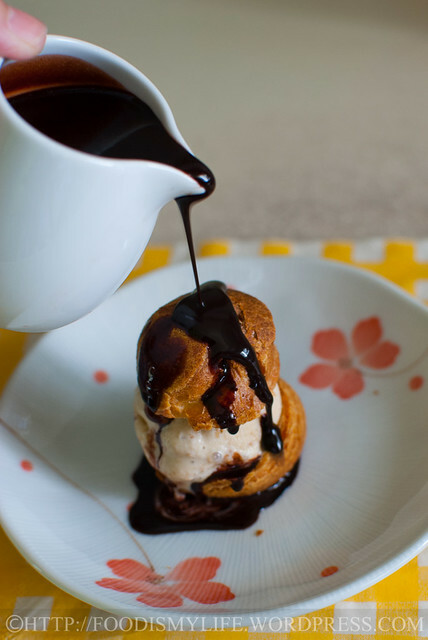 The sight of your sauce dripping down a profiterol has me salivating. I need some vanilla ice cream. I have everything else needed. Yum! I am so gonna try this one of these days! Thanks for sharing! Mmm…. Now I feel like ice-cream…. 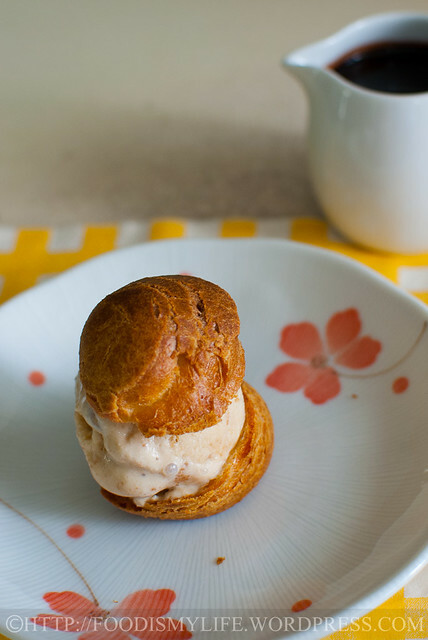 Oh my goodness, I cannot WAIT to make this….You had me at 3 minutes…. No excuse not to have dessert now. 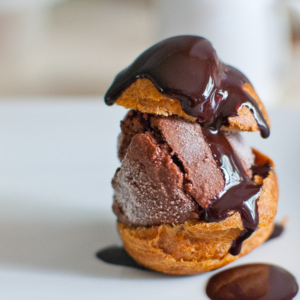 Your ice cream stuffed profiterole with chocolate sauce looks yummy. Sounds like a yummy sauce and 3 minutes… amazing.